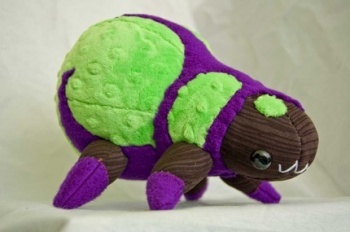 You can cuddle this oddly adorable fan-made Baneling plushie and it won't blow up in your face. I'm not quite sure what it is about StarCraft II's Baneling. It's slimy, pustulent and green, filled with noxious and explosive acidic juices. It will waddle (or roll) up to your base, burst in a suicidal blast and melt your face off. And it's somehow adorable. What the hell? This fan-made Baneling plushie seen over on Etsy perfectly captures the bizarre cuteness of the Baneling, only it's more huggable than it is lethal. Sadly, this was a one-of-a-kind item that has since sold out, but perhaps the creator could be convinced to make more with enough interest? Or perhaps Blizzard could take a hint and start selling these officially. That'd be great, too. I just kind of want to ... take it and roll it down a hill or something.